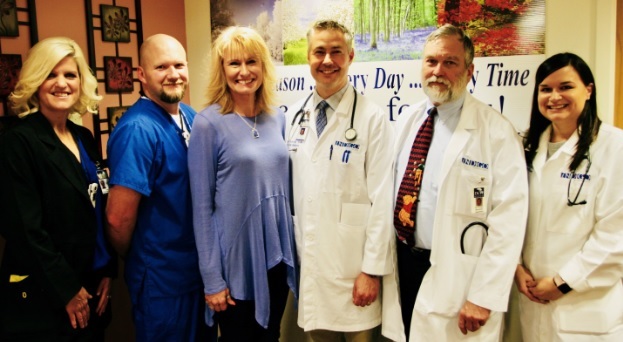 Pictured from left to right: Christie Borchardt, RN, BSN; Trenton Rankin, BSN, RN, CEN;	Valerie L. Sevegney, UP Provider Outreach Consultant BCBSM; Troy W. Ahlstrom, MD, SFHM; Kenneth W. Friar, MD, SFHM; and Megan Land, NP. IRON MOUNTAIN — Valerie L. Sevegney, UP Provider Outreach Consultant for Blue Cross Blue Shield Blue Care Network of Michigan was on site to present the coveted, Provider Distinction Award for outstanding contributions in helping Medicare patients with Blue Care Network or Blue Cross coverage receive “Star Quality” care, as measured by the Centers for Medicare & Medicaid Services’ Star Ratings. The BCN Advantage and Blue Cross Medicare Plus Blue PPO annually recognize the most distinguished Medicare Advantage physicians and physician office groups with Providers, with Provider Distinction Awards, when they deliver routinely on their commitment to excellent health care practices. The Dickinson County Healthcare System recognizes the iNDIGO Hospitalist Group as the primary provider of our inpatient care and is a large contributing factor to the earning of the award.